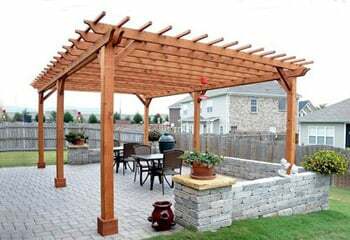 Your guys pit in a full day, and the pergola looks GREAT!!! The two workers you sent were great, I had some concerns on 1 post, and they corrected it with out even asking any questions. I caught them just as they were packing up, and they went back to the truck to get their tools to fix what I saw. Your company's product is fantastic, and the service has been outstanding. Thank you for working with me to get everything done. I will recommend Forever Redwood to my friends. 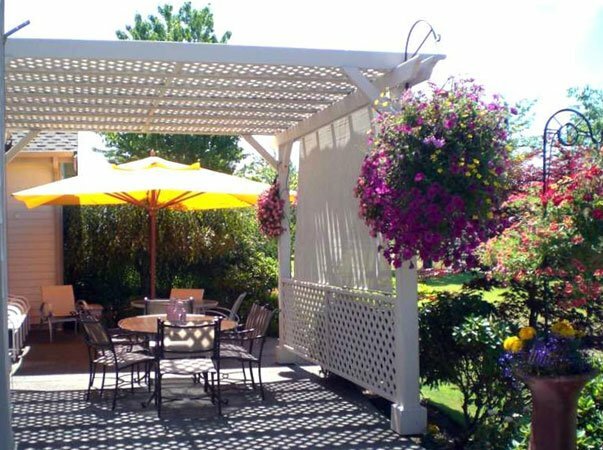 You sold me a fantastic pergola a couple years ago for my home – is really great. 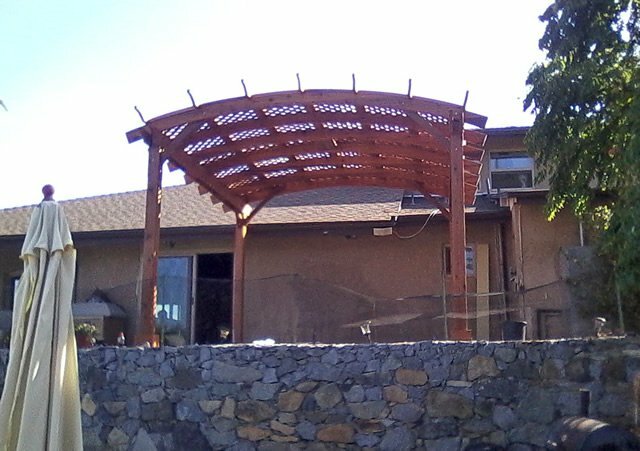 We finally got our pergola up. It only took two days. It went together very well. The shipping crate was a little worse for wear by the time it got here but everything was there and in good shape. We are pleased with the product. We are so pleased with the beautiful wood and quality of this piece. Plus everything did fit together! We love the set and so does everyone who sees it . Just to let you know, we love the set and so does everyone who sees it – photos are attached. 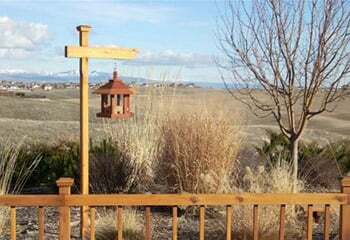 It’s shown in area where we hope to get approval for pergola. The redwood was beautiful and assembly was very straight forward. 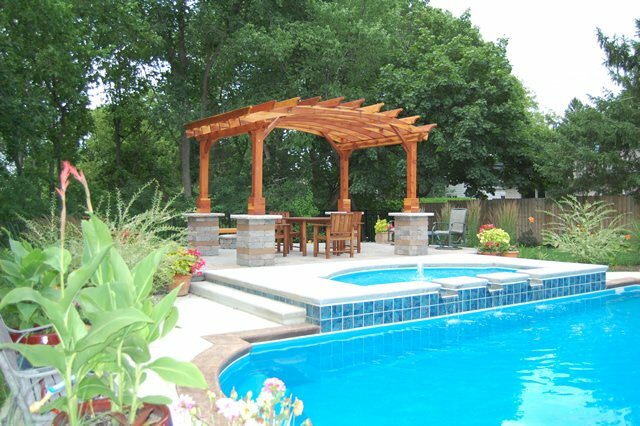 They delivered everything they promised from design services to delivery of a well built pergola that was custom designed. The redwood was beautiful and assembly was very straight forward. The products were as promised and delivered on time. 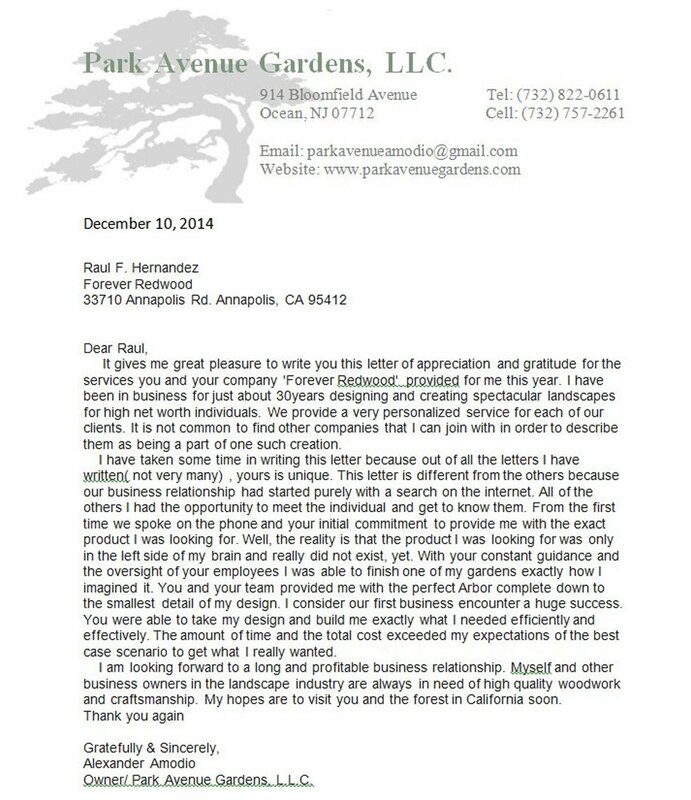 Forever Redwood was a great company to work with. The products were as promised and delivered on time. 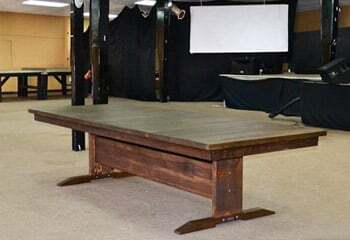 Pretty hard to build over 100 tables in a short time, but they did it! 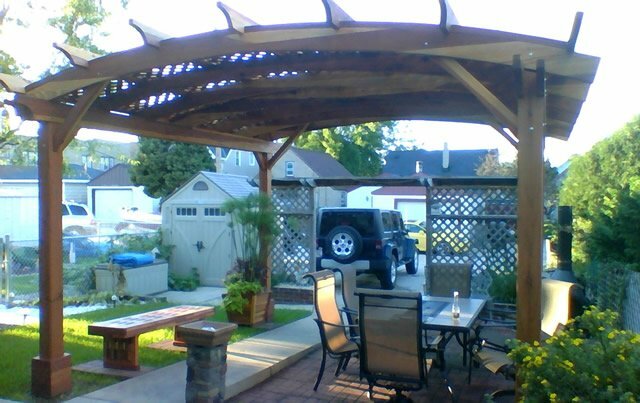 We have received several favorable comments about the Pergola and inquires as to where we bought it. 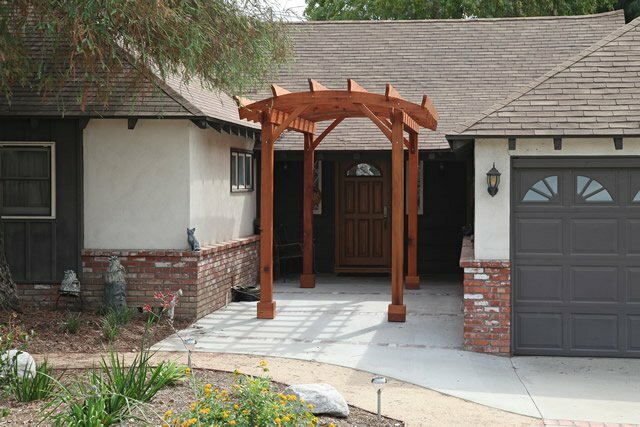 My contractor has completed the installation of the Pergola into my home's entry area (see the first picture). 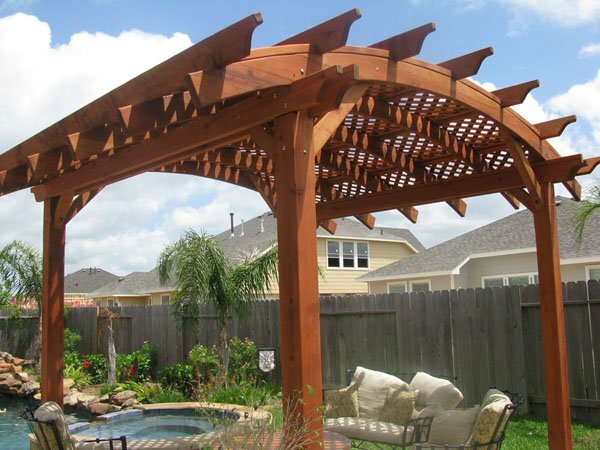 We have received several favorable comments about the Pergola and inquires as to where we bought it. The installation went pretty smoothly even though the tight space and the slope of the concrete pad (necessary for drainage) posed some challenges. There is some minor damage to one of the footing covers (see the second image) which we believe was caused by the carton containing the footing covers being dropped - the corner of the carton looked like it had suffered an impact. We have the piece which was broken off and will glue it in if you are unable to supply us with a replacement part. You & your team did a great job! Hi Raul, Tania, Tony, Alejandro & everyone who helped. 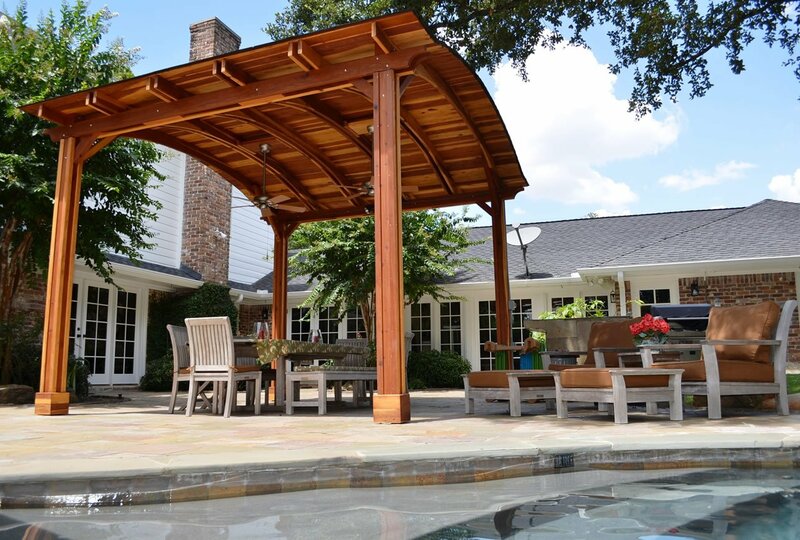 We love our gorgeous pavilion & glider. Cesar & Adan were great. They worked so hard & long in the heat Saturday & early Sunday to complete the assembly in time for our granddaught Leah's 3rd birthday party. The glider was done 1 hour before our start time of 11am. 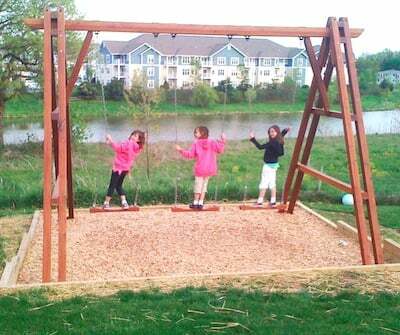 Kids & adults love the glider! 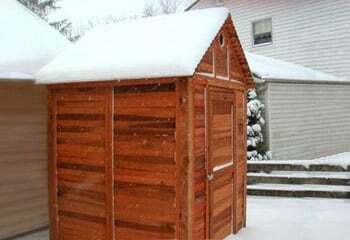 They all commented on the wonderful quality of the pavilion, the beauty of the wood. Thank you so much for making this happen!! I will send some pictures soon. 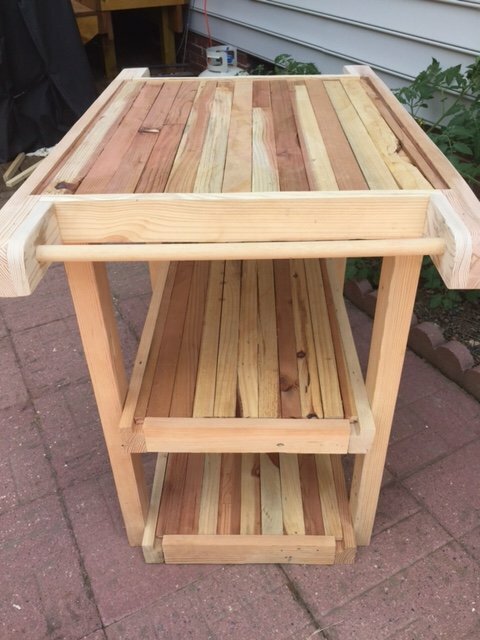 I wanted to share some pictures on how I was able to reuse your shipping pallets to make a nice side cart. 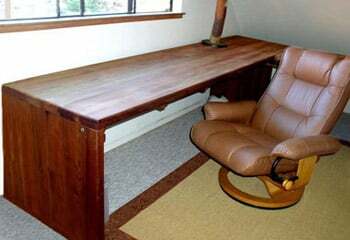 My friend Fritz Lehman ordered furniture from you. When the furniture arrived he was very intrigued with how different the shipping pallets were. He asked if I had any desire to take the pallets. I jumped at the opportunity to do so but at that time I wasn’t exactly sure what I was going to make. Thanks for allowing me to make some good use of your pallets. Oh Fritz ordered some more furniture. I am looking forward to round two. Now what to make? Attached you will find two pictures of the unfinished product and two pictures of the finished product. Well it finally arrived and it's amazing! Thanks so much for your great work and service. We are now officially fans and will spread the good word! Take care. Nice photo! I am so glad to know that your set is working well for so many years. 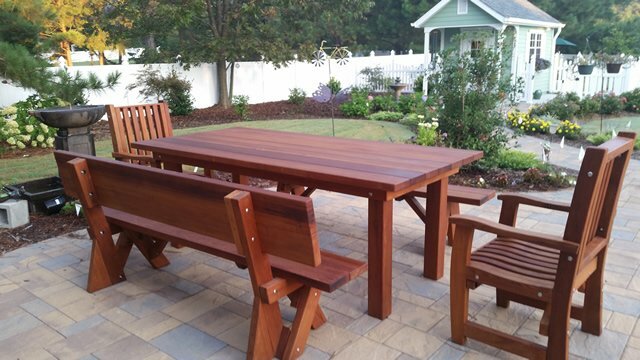 Thank you for your submission and being part of our 5th Annual Forever Redwood Customer Photo Contest. We will announce the 20 finalists via email in two weeks. Did your order arrive OK? Thank you for reaching out. 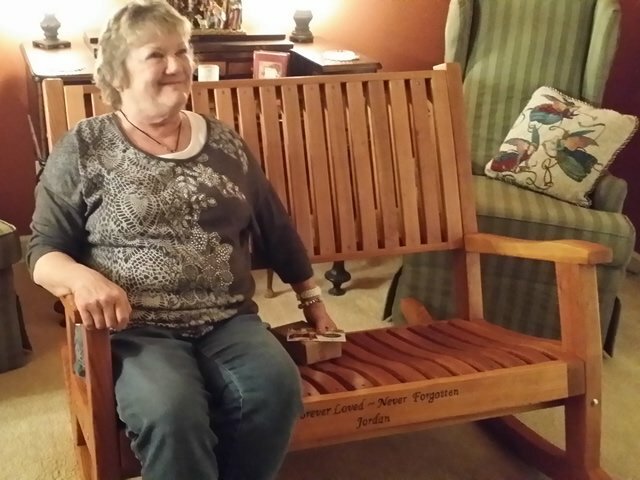 ?Our Redwood bench arrived just in time to honor the person we had ordered it for. It is absolutely beautiful! 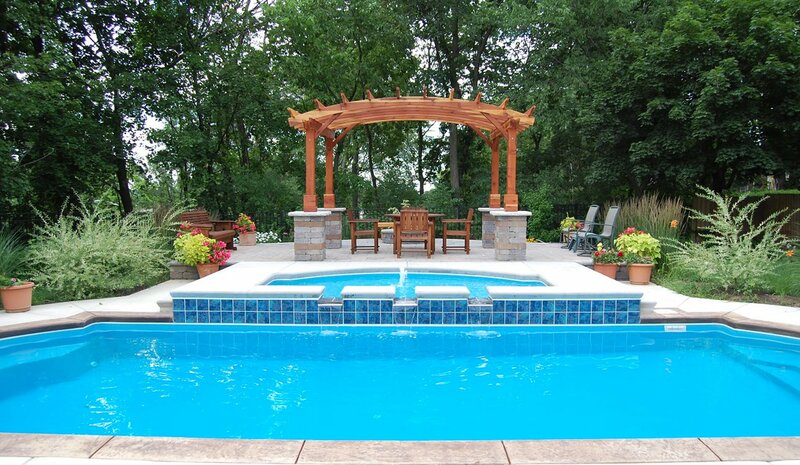 The men who delivered and assembled it were very nice and professional. 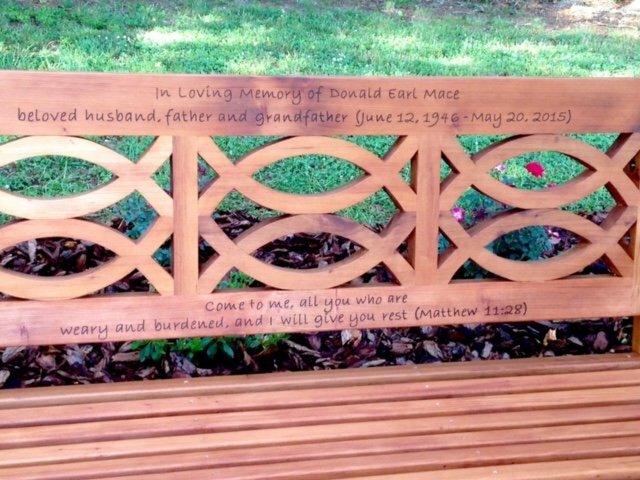 They took time to talk with me about proper care for the bench and made sure it was placed exactly where we wanted it. Everyone I was in contact with through this whole process was extremely helpful and responsive. 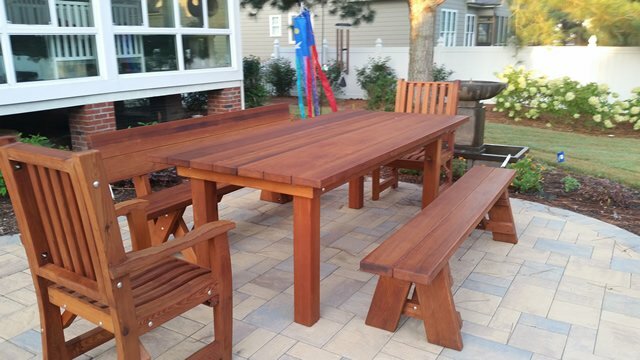 We are very happy with our order and our choice to use Forever Redwood. Thank you for taking the time to write. Glad everything was to your liking and thank you for your trust with this delicate job. Please let us know if we can help with anything down the road. 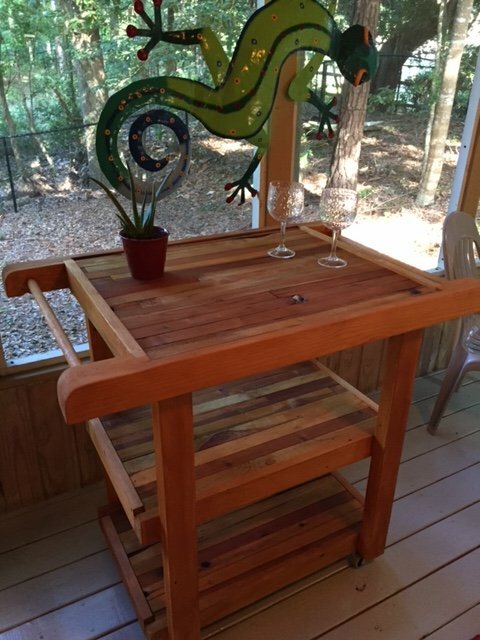 We absolutely love the table! Everything went well with the delivery. Instructions were given on how to setup and fold up the table. The guys also were and extremely friendly and courteous! YESSSS!! 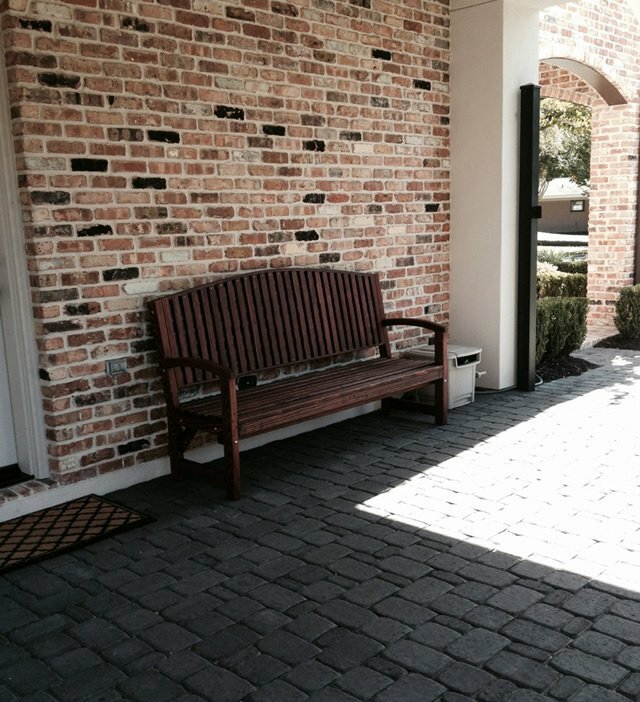 Our bench arrived on time, and it was very easy to assemble. It looks BEAUTIFUL! And we especially love the engraving. Excellent. Glad we got it to you on time and you are happy with it. If you have the time to send us a picture or two, we would love to see how it looks in the place it was intended to be. Again, thank you for your trust. Thank you for your prompt service and customer service. However, Roadrunner Transportation has dropped the ball on delivering and will probably refuse to give our shipping cost back. I have had to drive to Charlotte, NC for pick up. Again, thank you for all your help. I have to wait an additional thirty minutes before I can load it. I would recommend for you guys to use a different carrier in the future. This is really unprofessional of Road Runner Tania. Are they coping to any of this? Any chance we can get some of the freight cost refunded for this?? Wanted to say thank you to everyone. 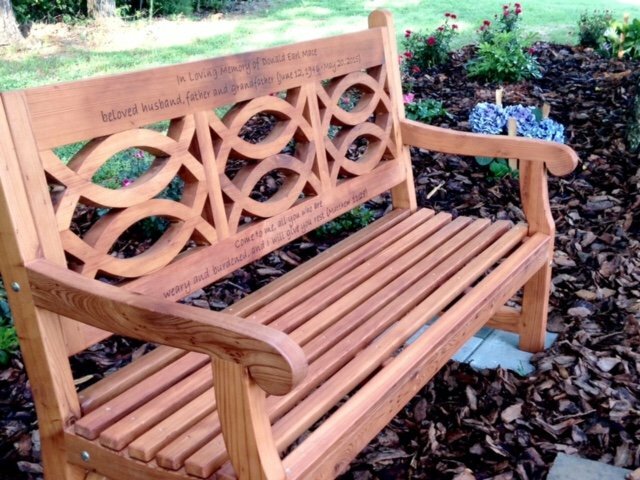 The bench is absolutely beautiful. Keeping with tradition, Adan sent me a photo taken in the dark after they finished. I know we pushed the time limit with your vacation plans. Hope it met your expectations and that you can send a few photos with and without the ShadeFX structure opened. Thanks again for your trust with this project! It looks fabulous!!! Gorgeous. Adan and Ceasar are incredible. Hard working guys who do excellent work. Both are a true true asset to your company. We had some stuff in the refrigerator that we gave them for their road trip to Ohio. We also gave them an extra $50 a piece as a bonus because they sooooo good. We couldn't be happier. You guys are all first class. Everyone of the people we dealt with along the way including you of course was very professional. Thanks Scott. Appreciate your saying what you did. Have a great trip and we will be in touch soon. What is the best way to clean the floors? Is s sealant needed to prevent water damage? How to fix any gaps or scratches? Do you think Miguel can swing by Yvonne's in the next couple days? Yvonne, Adan has been out of state for the past few weeks and is heading out again after just a couple days rest. 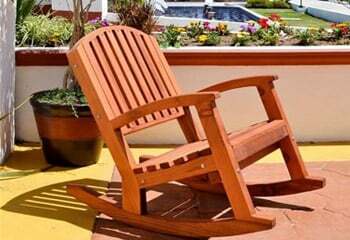 Miguel Munoz is a highly experienced carpenter and is out doing deliveries near you. He can fix these issues in a few hours. Tania, please let Yvonne and I know when he can swing by and clean up the pending issues mentioned below? No worries, I am around until the 15th of June and as long as they are done I am fine. I also forgot to mention that Adan said I could clean the windows. Well I did the best I could but the glue that was used would not come off with window cleaner or Goo Be Gone, but the back of the windows that covers the screens cannot be cleaned without removing the windows! I didn't realize this until after I started cleaning. Please add this to the list I sent. Thank you. How did the guys do? Mission Accomplished? Thanks for checking in again. Miguel did an awesome job! Mission accomplished although there is an area that needs to go back to the drawing board. All missions need adjustments for future endeavors. The sky light that was designed so that it can open and close does not, at least not be needing to climb a ladder!! It is really the funniest thing I have ever seen since you can open it, but need a second pole (or hands) to push it open. The boys did say no one has ever mentioned or noticed this! 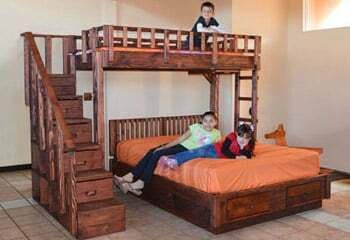 I sis mention to them that a possible solution would have been to use the same type of hardware that is used in ladders to lock them I place when opened. I will send you some pictures! I also think your suggestion of a different floor would have been better as even during the building process it does scratch. 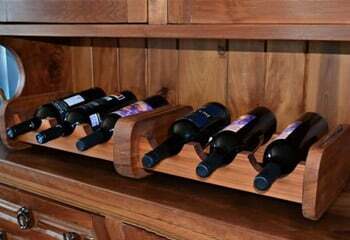 The solutions for the draft was also easy as I suggested a strip of wood similar to the ones Adan had suggested for the doors. It looks beautiful! Thank you and thank you so much for listening to my concerns and working so that it was what I needed!! Your crew did an excellent job, the pavilion is beautiful. They did not get done until after dark so they could not get pictures, I will take some and send them. We are so impressed with your company and products, we had so many neighbors stop by and look and make wonderful comments. Hi Raul, Well I am not going to say too much. I have attached a rough draft of the letter of appreciation and a photo. 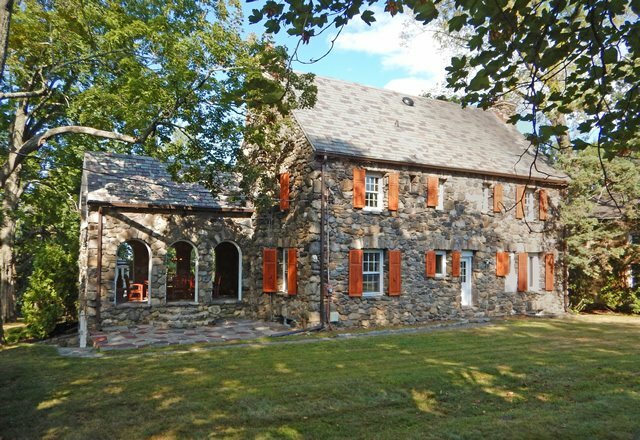 I also emailed Jesus so that I can put the final draft on HOUZZ.com. Please let me know what you think after your review. Hope you have had a nice summer, and where in the world did THAT go? Still too hot down where we live to think much about Fall yet, but we are suppose to at least get the temps out of the high 90's and into the 80's this week for a little cooler weather! The V shaped bench arrived last week and Phil assembled it this weekend, and not only did he comment on how easy it was to put together but also how well designed it was. 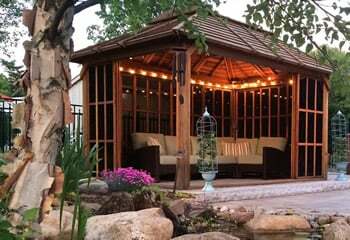 And for me, it is all about how something looks, and it is absolutely gorgeous and is the perfect addition to a main deck and entrance into our home. And I absolutely love the mosaic wood, and so happy that I selected that for all the pieces we have so far purchased from you. Thanks again for all the beautiful work, and I look forward to buying more stuff from you in the future! I installed the shutters, they look F*****g Beautiful! (sorry, that was the first thing I said when I opened the boxes and looked at them) They are amazing and I am very grateful to you and your staff. 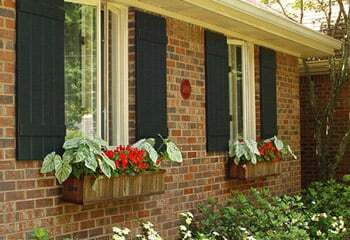 Everyone in the neighborhood complements the shutters and the table, even strangers just passing by. I have to stop for a minute every morning before I drive away from the house and admire them. 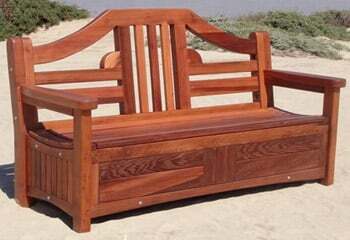 I am sending you some pictures, I am convinced that you guys can make anything out of red wood better, nicer than anyone else. Raul, I would love to have you over. If you can, it would be great, I would be honored if you stayed at my house. I can also give you a car to get around, and whatever else you need. I hope you are doing fine otherwise, and please keep in touch. Hope to see you whenever you can make it, bring whoever you like, you are more than welcome. Your team did an excellent job at the install. Cesar knew exactly what to do - I could tell he has done this many times. The team was very friendly and worked very hard to finish the install on Saturday. I even let them use a few of my tools :-) to help them get the job done faster. 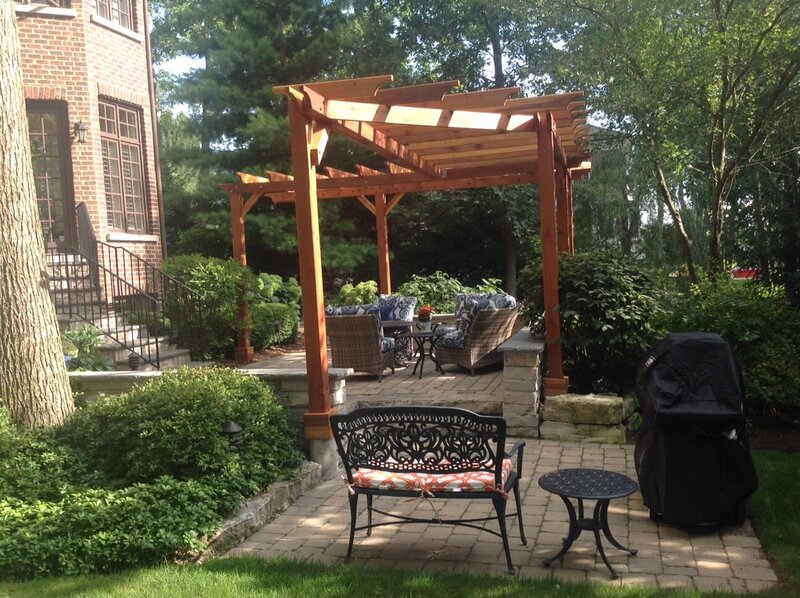 Plus - the pergola looks much better than what I imagined! 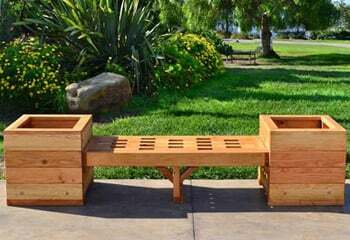 I Love my Pergola and bench and planter. I'm hoping the picture comes through to you, I would like to enter it in the contest. Please let me know if you receive it! Thought you might like to see the finished pavilion shingled & electrical in place. It was worth waiting for. We are all thrilled with the final result.If it can help you, feel free to use me for a testimonial at any time. I just received the planter and it's beautiful. Thank you both very much for your time and attention. 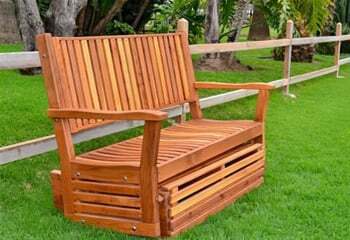 Your customer service is excellent and you're peoples craftsmanship is super. Thanks again and I look forward to buying from you in the future. Hi Raul and all the helpful ladies! We finally got some nice picture of the pergola and planter boxes we purchased from Forever Redwood. 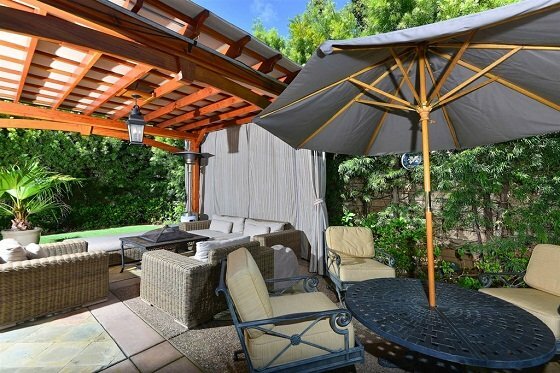 We are very happy with how our yard turned out, offering both privacy and much needed shade. Thank you for your wonderful product and service. I want to personally thank you for the excellent customer service you provided me recently. The shipment of my order went smoothly. I have completely assembled the table and chairs and it is magnificent!! I was totally impressed with the detailed directions, labeling of the pieces and quality of the hardware. Although I waited a long time for my order (4 months) I feel like it was worth the wait. 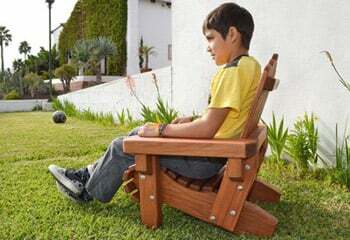 I will recommend your company to all who admire my new patio set and will not hesitate to do business with you in the future, Please share me sentiments with the owner of the company. Thanks again for your kindness and excellent customer service. It was greatly appreciated. 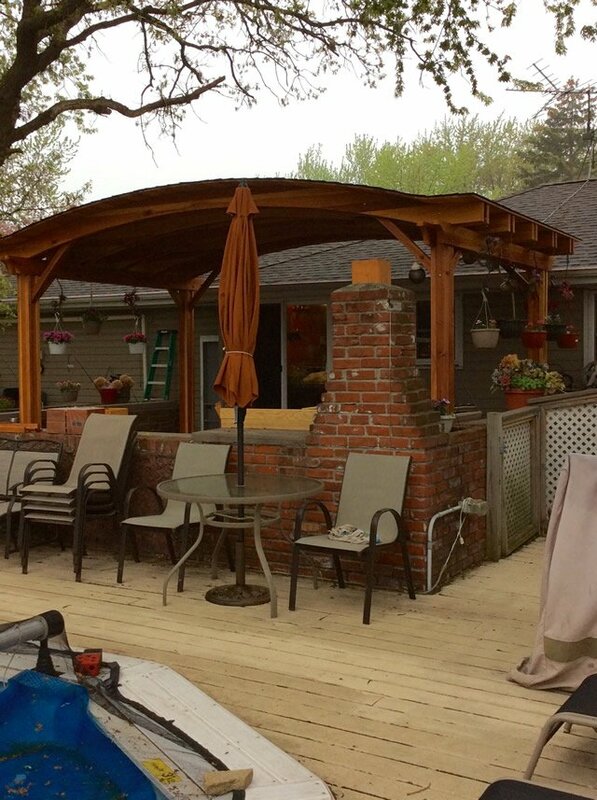 Hey guys, thought you might like to see pics of the new pergola we just finished today. It was late in the day, so I'll take and send some more pictures later this week in full sunlight. 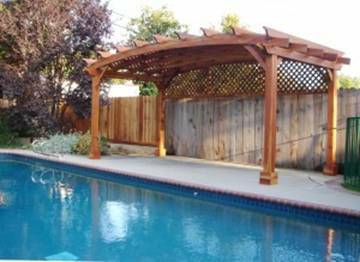 We bought the pergola from Forever Redwood in California. It was a breeze to install it. 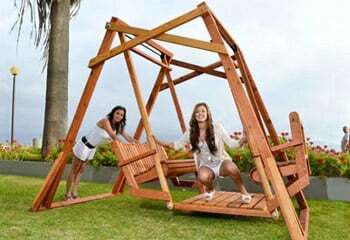 It took less than 5 hours to assemble it. Your work is FANTASTIC! 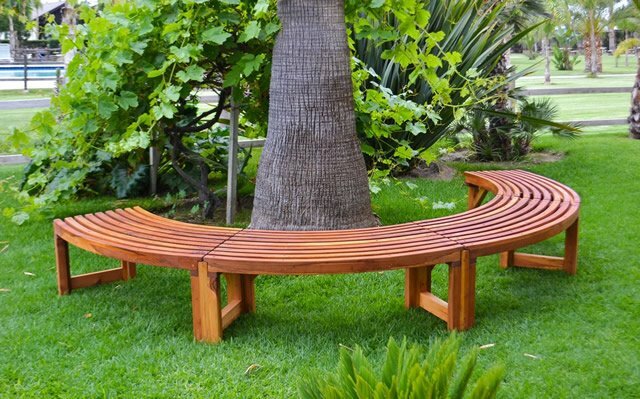 The circle benches around the tree and picnic tables are beyond comparison -- amazing. Thank you so much. Samples of products purchased by Toody M.
I promised I would send you pictures of our dear friend/co-worker when we presented her with the Ruth Rocker Bench. Of course she loved it !!! The installation went as planned. No on-site modifications were needed. The installers (Cesar and Pablo) were very considerate and careful, and I was very happy with their work. 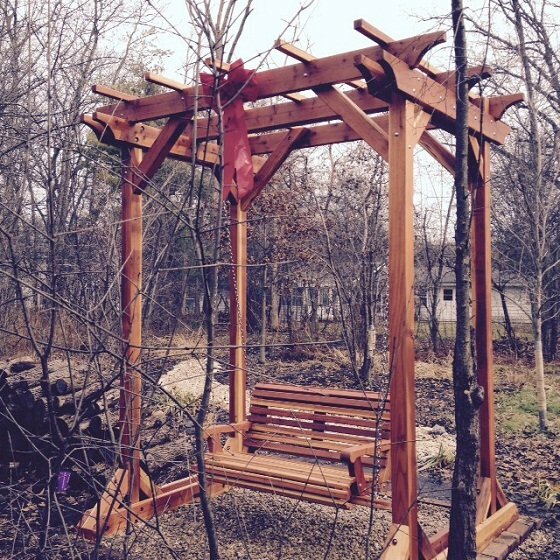 Our new pergola is beautiful. I will send you a picture. 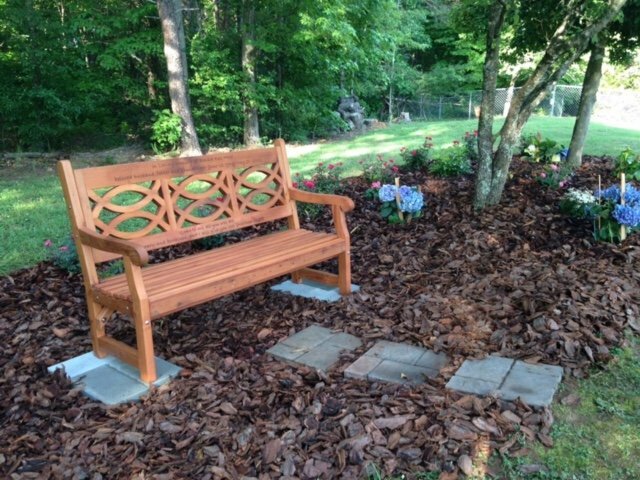 We finally got the bench in place yesterday. 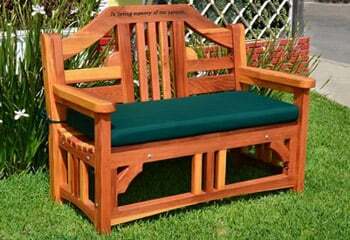 It is a marvelous piece of craftsmanship. The plaques are all correct and in the right order, etc. 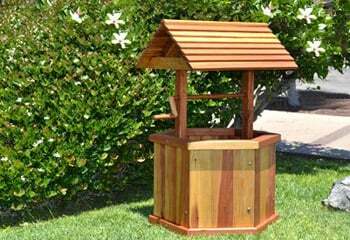 I just want to tell you how happy we are with the gazebo we ordered from Forever Redwood. 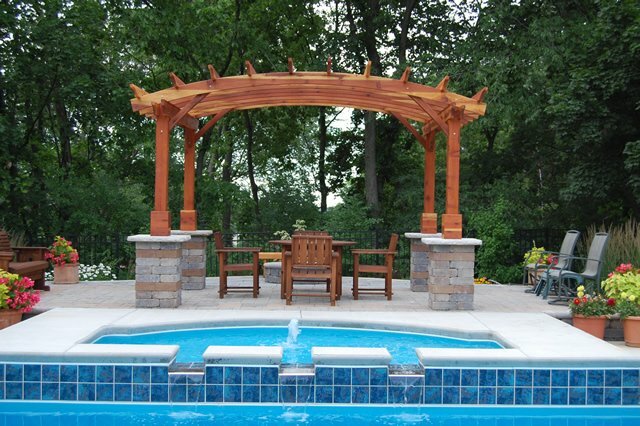 Your company was great to work with, and the builder we hired to put the gazebo together was very impressed. 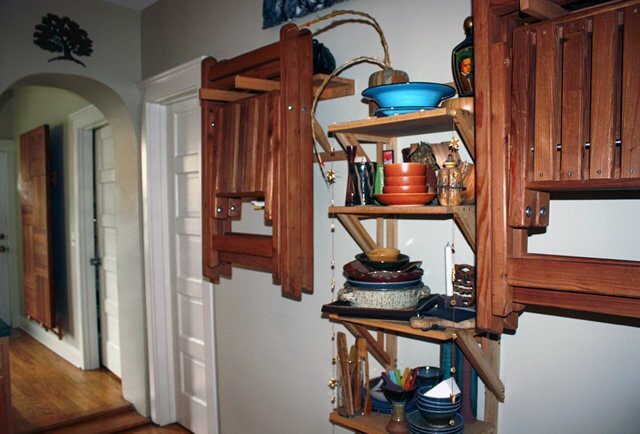 He said it was extremely well built and everything fit together perfectly. It was actually a delight to work with. Thank you for providing such excellent products and service. I just wanted to let you know that my fabulous bargain table and benches arrived and set up with magical ease. 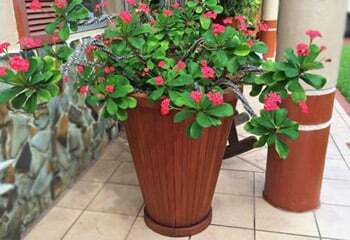 They are truly beautiful and promise long life and beauty ahead. 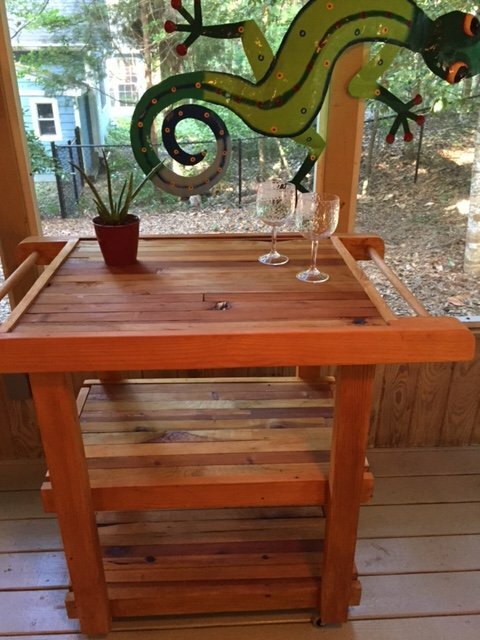 My last redwood table and benches, at a tenth the price, from a local source, lasted nearly 50 years, but they were fastened with steel so the joints gave way too soon. The wood was always okay. I suspect it was old-growth redwood because nobody was caring about the environmental costs in those days. Anyhow, I just wanted to let you know I am tremendously pleased with the product and salute you for your restoration commitment. 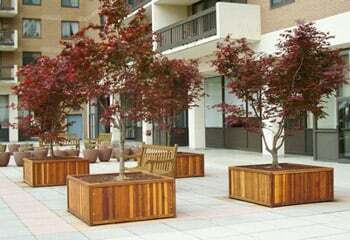 Your redwood is outstandingly lovely! BEAUTIFUL!!!!!!!!!!!!!!!!!!!!!!!!!!! 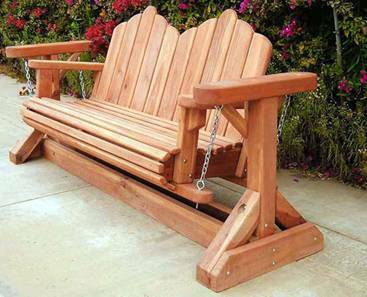 Your redwood is outstandingly lovely! 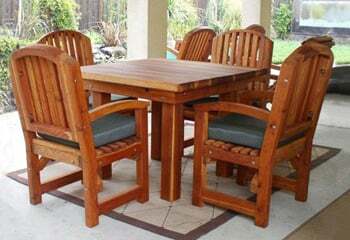 I have never seen any redwood furniture that comes close to the quality of yours!!! Just want to let you know that everything showed up just fine and I put everything together this weekend. It looks even better than we expected. Your product is by far the best that I found, looks great, and went together just like silk. Photos will follow. 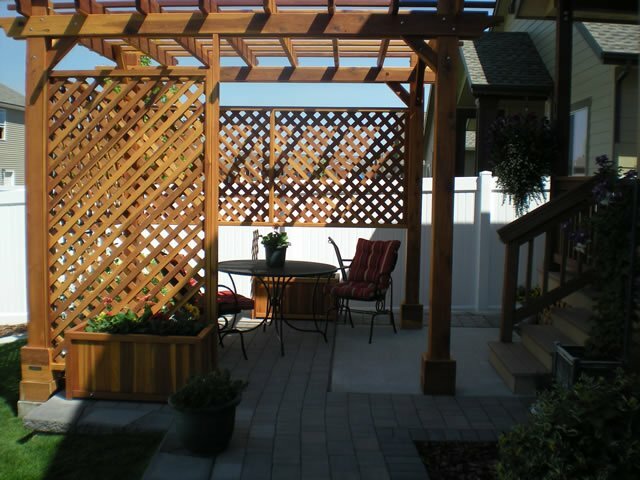 Here's a shot of the Pergola. Let me know if you want me to take any more. Your guys did a great job and K. and I are very pleased with it. The extra inch on the back right was all we ended up needing to get the level. I don't think the shims made the trip in any case. Thanks again to you and your team for all their help. Please don't hesitate to call on me should you need for someone to come by and see your work. Hi Raul, Thanks for your personal email. That's a nice touch in this world of automated responses. Look forward to receiving and enjoying your product. 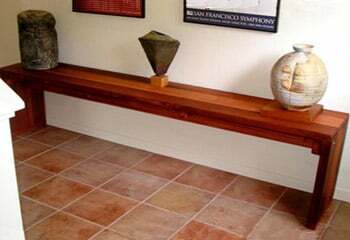 Just so you know this is a replacement for a redwood table we've had for over 25 years. We had a storm last Sunday and my wife had left the umbrella up which caused the table to tip over and break into about 6 pieces. It has been sitting out in the elements for all that time. 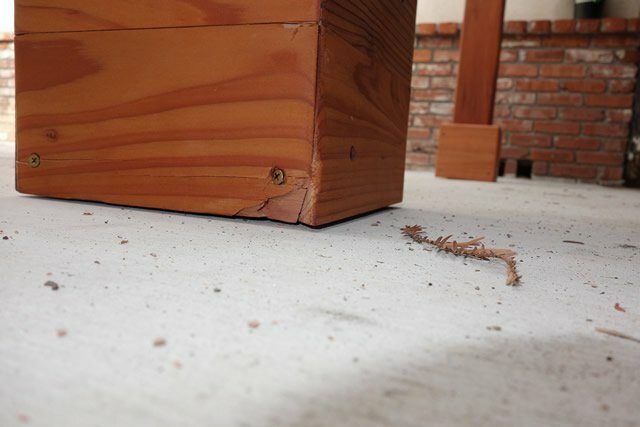 As I examined it while picking it up I noticed that almost all the boards were intact and not decayed in any way. The table simply came apart at the connecting points. The screws and bolts had become rusty. This isn't the first time that this table has gone for a ride in the wind but it was the last. 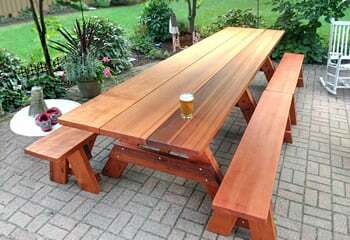 The longevity of my first redwood table made me seek out another one. We made a mistake a few years ago and actually painted the table. We won't be painting this one. Since we're both in our mid 60's this will surely be the last one she or I ever have to buy. 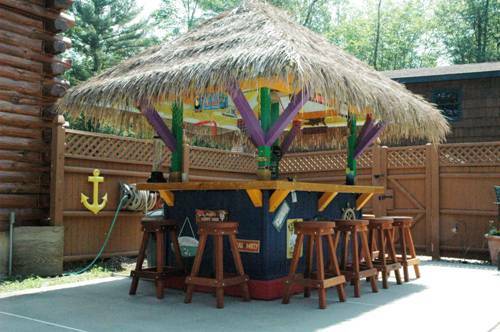 Here is a photo of your Redwood Stools in place around our Tiki Bar. My son in-law and I built the Tiki Bar last summer and we let the kids decide how to paint it up, and you can see that they chose festive decor! We spent a fair amount of time searching the internet for the perfect outdoor stools that would look great around the bar. 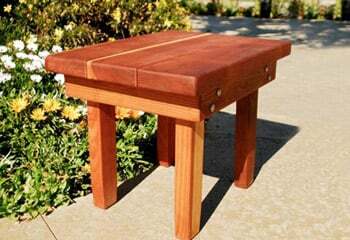 It was clear and evident to all of us that once we found the Forever Redwood website our search had ended and we feel your stools look great! 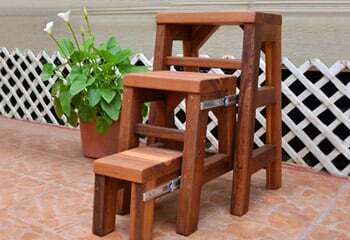 The stools are fantastic and the woodwork is top tier. Thanks! 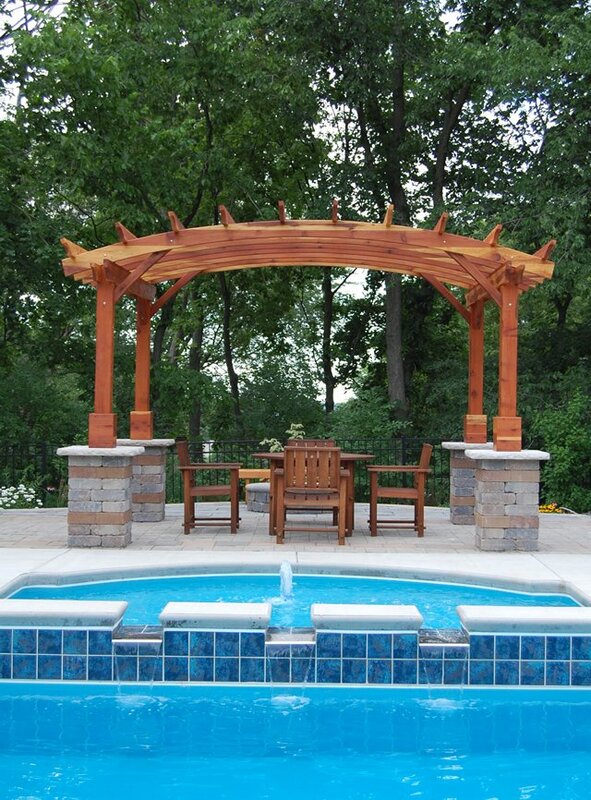 I just wanted to let you know how very pleased I am with the purchase of our 16×20 Pergola from Forever Redwood. The wood was beautiful and the installation fairly simple, even for two old guys who had never put one together before. 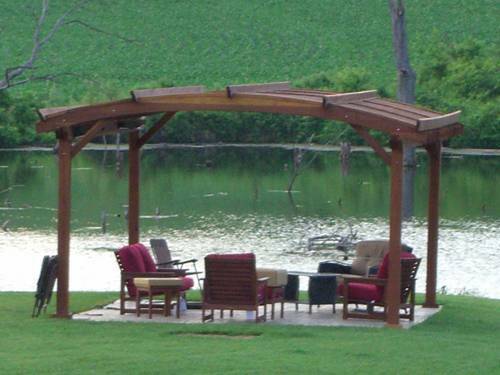 We installed our new pergola on our little lake island, pictures attached, to provide additional shade. 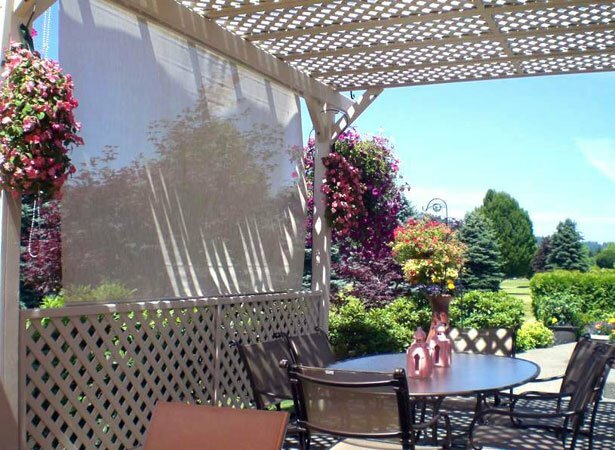 I know people are concerned about how sturdy their pergolas might be in strong winds. 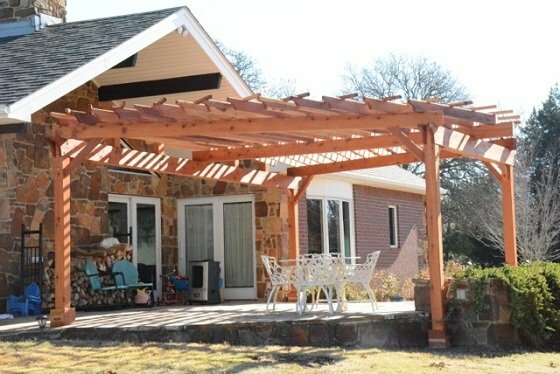 Within two weeks of installing our new pergola we had a strong storm pass through our property that produced 80 miles per hour straight winds. 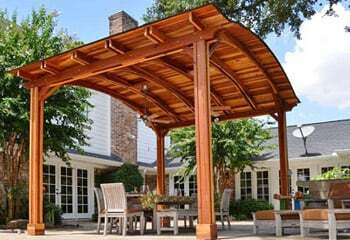 Our pergola stood up with no problem or damage unlike the many trees we had that lost significant limbs. Thanks again for the wonderful design and construction. 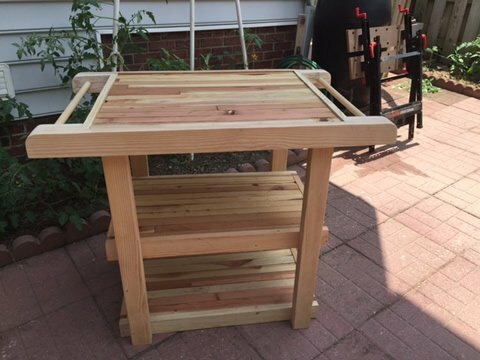 Your table is great, as well as the beer case my girlfriend ordered from you for my birthday. 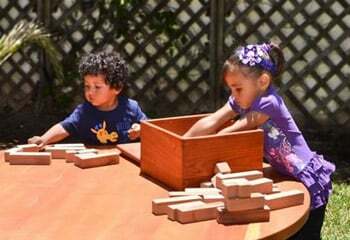 Matthew ordered a Rectangular Folding Table with Folding Benches. The beer case was a custom job. If you have something special in mind that you don't see on the site, just contact us! 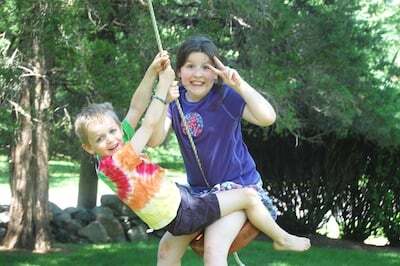 The swing was a HUGE hit! 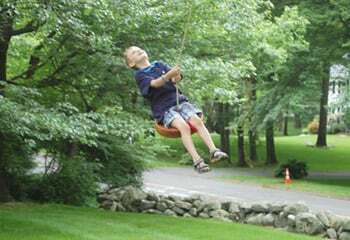 We thought you would enjoy these pictures of our children at their grandmother's house in Wilton, CT. As you can tell, the swing was a HUGE hit! Wow, I'm impressed. 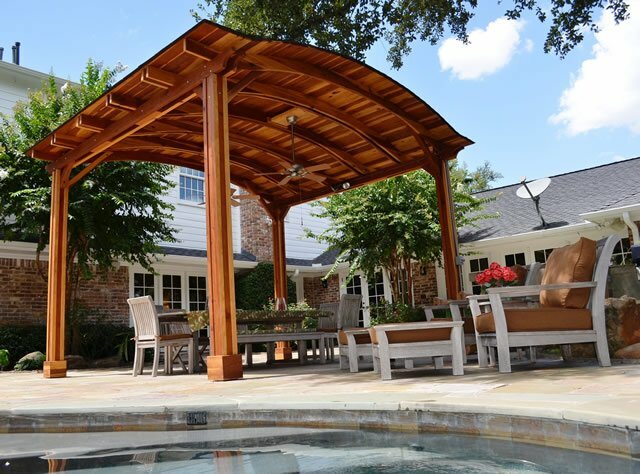 The pergola is even better than expected! The quality of the redwood is outstanding. Everyone is asking me where it came from. With help from a couple of friends, we assembled and anchored it yesterday in about 5 hours. Now I have shade in my backyard that I can sit under and watch my kids play in the pool. The pictures don't do it justice, but I attached a few to this email. 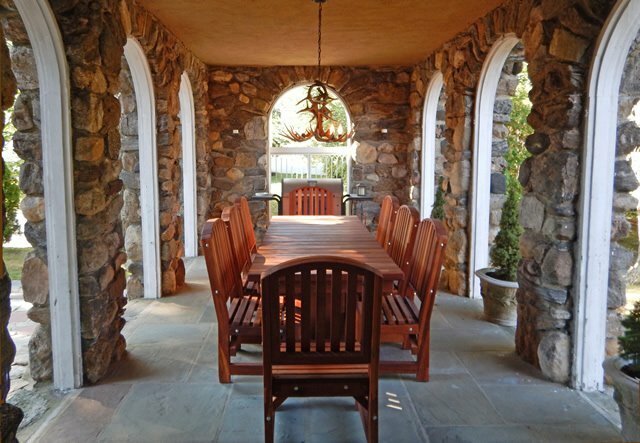 See more great Arched Pergola photos in our Hi-Res Pergola Photo Gallery. You said you were going to make a great swing and you did! Just wanted to let you know, though it was trouble getting up — It was well worth it. 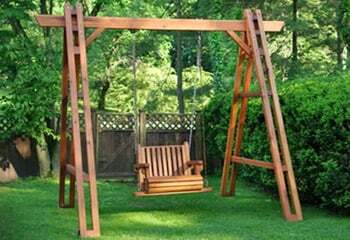 My three girls love this Swing —LIVE ON IT— and I never thought a swing could get so many looks from people walking round the pond in the backyard–to neighbors coming just to check it out saying how much they love it. Michael is an award-winning musician whose work has been featured on America's Got Talent. 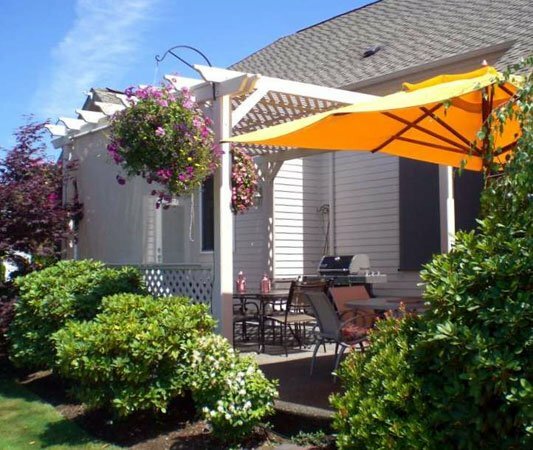 We love the new look of our patio and have gotten so many positive comments from our family and friends! We've had just a couple of opportunities to dine al fresco thus far this spring but we have been enjoying the Adirondacks around the fire pit when the evenings are not too chilly. The weather isn't really cooperating yet, which is par for the course this time of year in Iowa. We are having a lot of rain right now but soon summer will be upon us in all it's glory. Stay tuned…. I will send you some updated summer photos soon so that you can see our spectacular new outdoor destination! 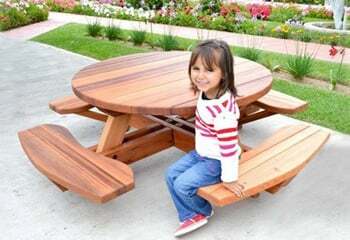 I recently purchased a small picnic table and benches as a birthday gift for my daughter in law. I just want to say thank you. It is absolutely beautiful and far exceeded my expectations. I searched for a long time finding nothing with the quality I was looking for until I found your online site. I am so glad I did not settle. She now has her little outdoor 'sanctuary' space and will be able to enjoy her table for many years. 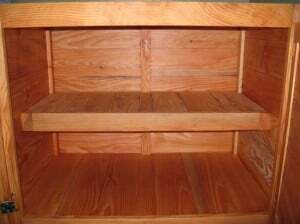 Again, the quality of the materials and craftsmanship in your furniture is extraordinary. Hope to send some more business your way shortly. 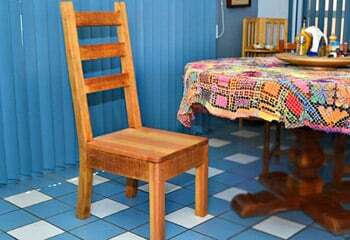 I want to start by saying how much I love the second stool that you sent me. It is PERFECT! Your time and effort to make right the miscommunication even though it was not a mass order and in a busy time of year meant so much to me. 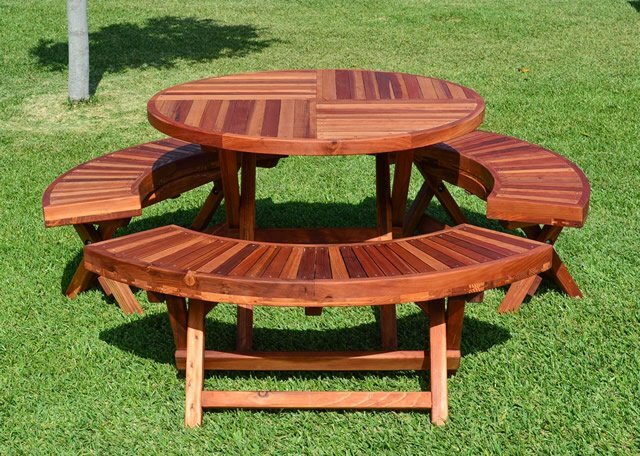 I will definitely recommend you guys to someone else, and if I or any company I work for in the future needs some specialty redwood furniture, I will definitely look you up again. Thanks again so much I greatly appreciate it Raul. 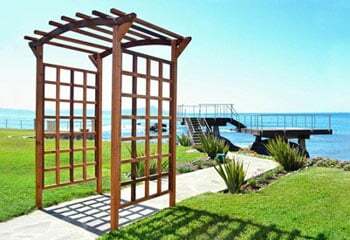 We are very pleased with the pergola. 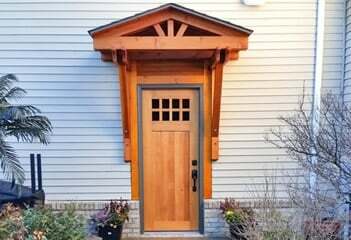 It exceeded our expectations and we think makes our house better looking from all angles. 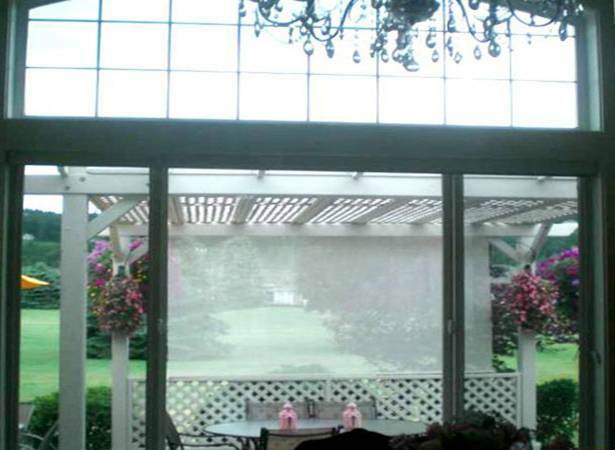 We think the privacy screen adds more than privacy. 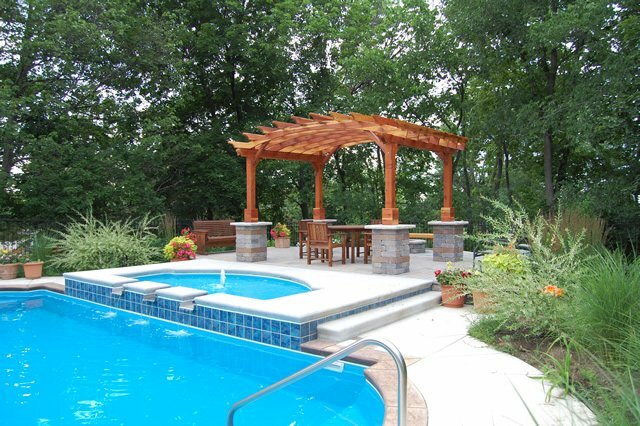 It acts as a architectural element and defines the space making it seem like an outdoor room and barrier to the deck drop-off. "My son and I set up a paint shop in my garage and painted it to match the house. We sprayed 2 coats of latex Kelly Moore 98-703KNT. That took about half the time. 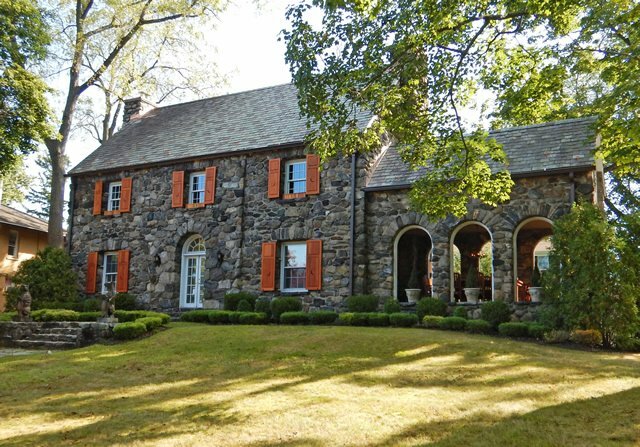 It is a light Tan and accents the house color beautifully. It took my son and me about 40 hours each working half days. There was a lot of start up-shut down time wasted. A lot of the time was figuring out the easiest way to do the next step." Dream up the possibilities... we'll help you make them real. Love the look, love the website, love the response, love the flexibility! Bravo! The size, weight and look are pure quality. We received our stools and are so pleased! I'm so glad I found your site on the computer. They were well worth the wait and money! The size, weight and look are pure quality. Thank you for following up. I'm holding on to your web site info for future purchases. Keep up the good work! We received our three seater glider today and immediately had it assembled by our handyman. 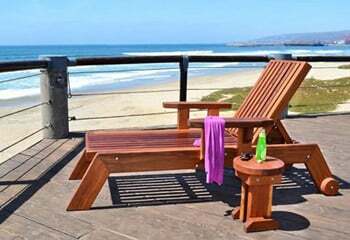 It is stunning and we thank you for your patience, advice and most of all for your beautifully crafted outdoor furniture. The chest is absolutely beautiful. Have had a series of strong storms here and it's holding up very well. Also very comfortable to sleep on. 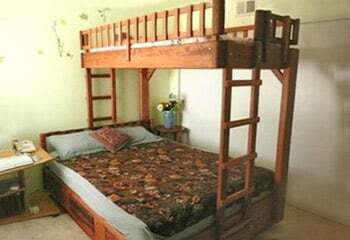 Note: Lydia's chest is a 12-foot custom storage bench with a 3-inch cushion on a hi-rise condo balcony in Miami Beach, Florida. 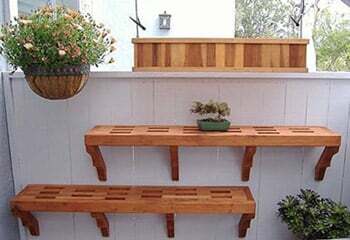 See our Wooden Storage Benches. You and your company are one in a million! Thank you for this friendly and informative email. 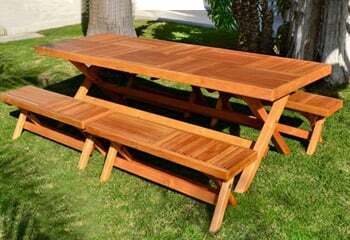 We were just admiring our picnic table and benches and wondering if we were taking proper care of them. After four years I think we are close to the totally silver finish which looks very good with our deck and aged cedar shakes. It's good to know that we can take the table back to its original color if we want to. You and your company are one in a million! Enjoy your children and your success. It is just the greatest, and I couldn't be happier. 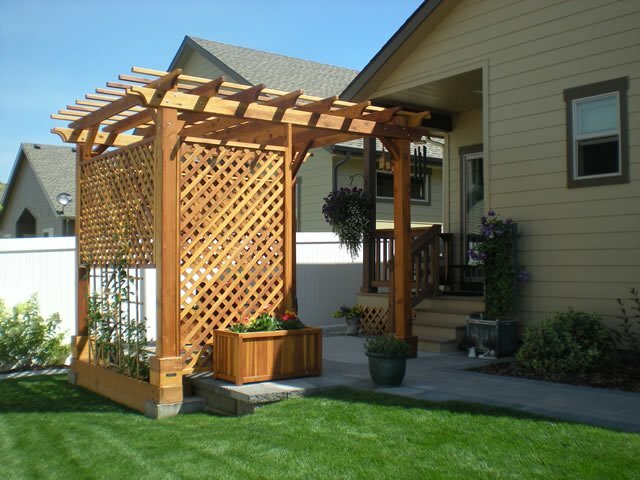 I purchased a pergola kit from you. 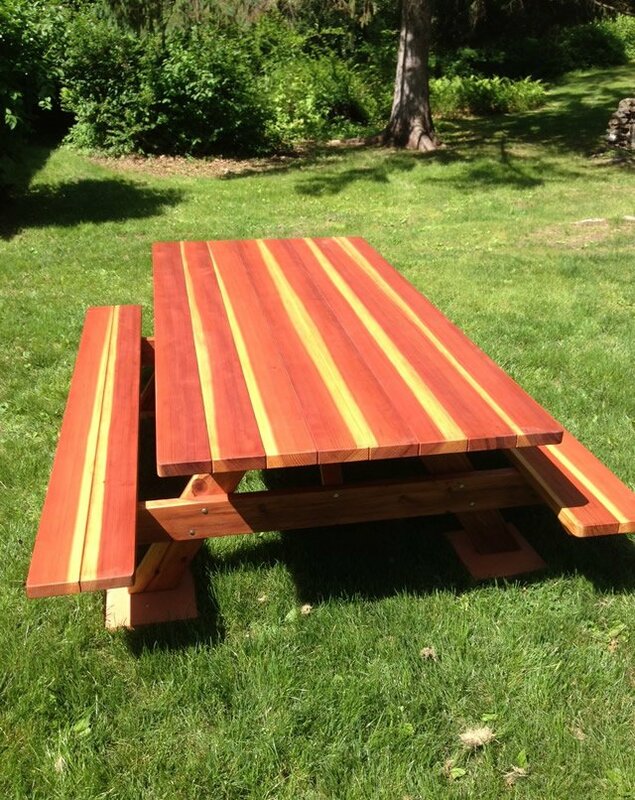 It is a 10 X 10, and was the middle [Mature Redwood] grade. 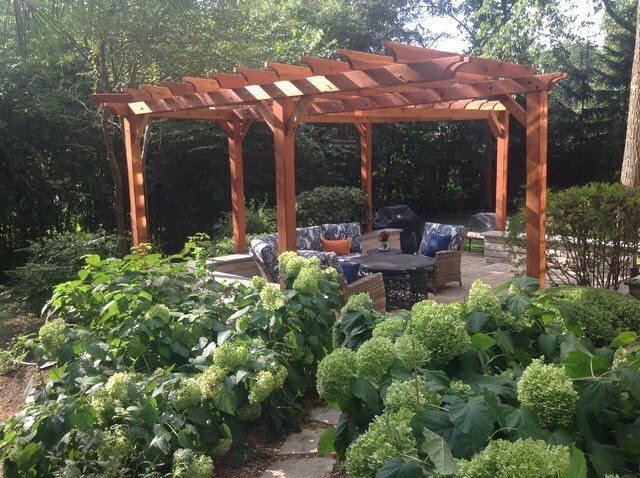 The pergola has been up now for two years and is just beautiful. 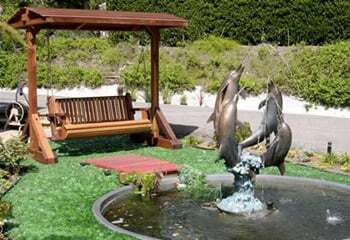 It is the focal point of the memorial garden that I created for my husband. I have planted some unusual trees by it and remember it is on a farm, so there is an old hay rake nearby. It is just the greatest, and I couldn't be happier. Thank you so much for such a wonderful product. Gil was awesome with the delivery and set-up, so I will call him also. (He called my cell on Tuesday, as I thought I was coming up that day, just wanting to hear my thoughts)! I'll take photos to email other family members … but we will all be using it all summer long and be very grateful to you and your staff! 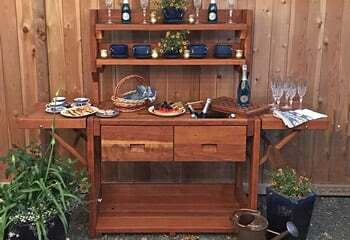 Here, at long last, are some pictures of the beautiful dresser you made for us. If they're not quite right, please let us know and we can take more. I hope they don't clog your inbox too much, I did not compress them… There are more, but these show the shelf off the best I think. Thanks so much– we love it! 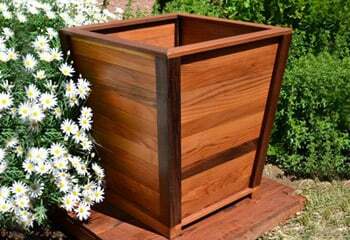 We are so happy with the planter you made us, it is beautiful. 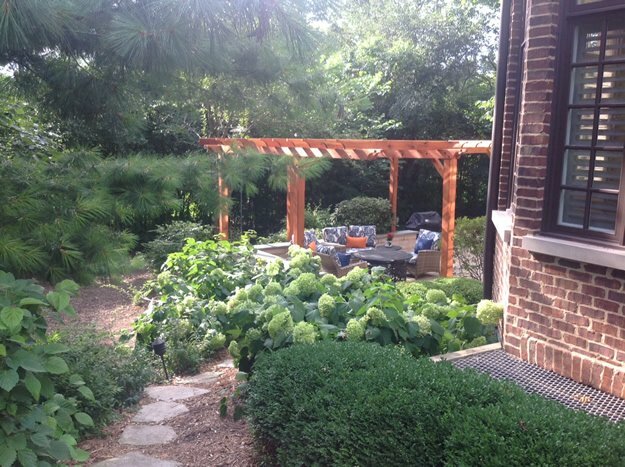 We added some gravel, miracle moisture-control dirt, vegetables and wow—step back and the plants are GROWING. 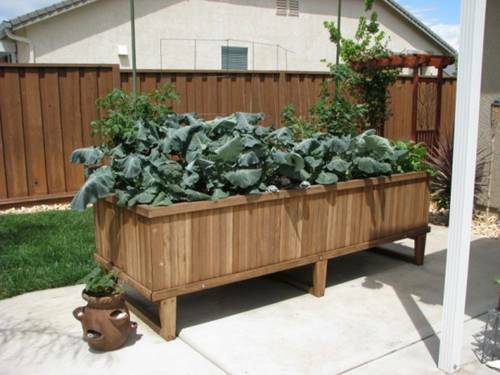 Our neighbors saw the planter and were so impressed they are thinking of getting one too. It is so nice to have something that you are proud to own and to help with the environment at the same time. It's veggies galore! Thanks to Nan for sharing this photo. 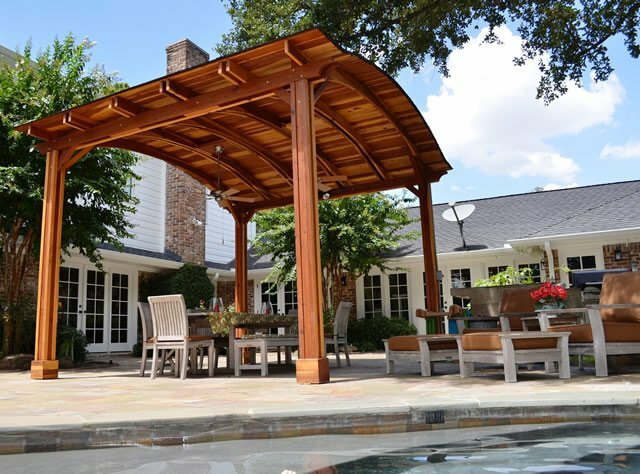 The pergola looks really awesome, even better than we could have expected. I got to watch the crew while they installed it as I was watched our tortoise roam the yard (she woke up from her winter slumber the night before). They handled the fit under the eaves and over the gutters like pros. We're very happy with it. Looking forward to some more projects. Please extend our extra thanks to the crew from us. Thanks Janet, Thanks Barry. All the planning was worth it. We got it right. 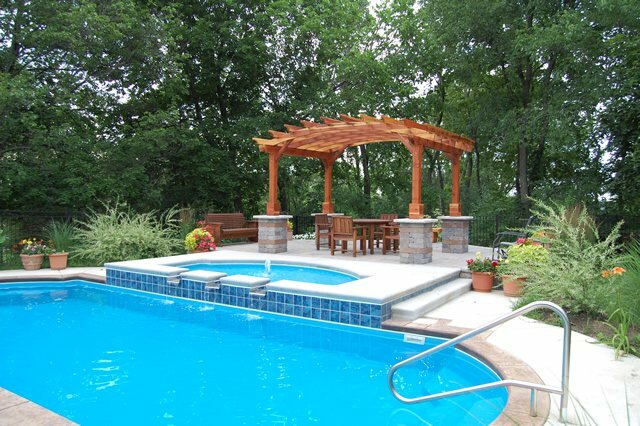 The guys have done many pergolas over the years, so it's a Lego set to them.